Interest rate of any economy can be determined by the demand and supply of money of this economic system. If demand for money is increase at constant supply then interest rate or cost of borrowing will be increase. On the other hand if money supply is increase at constant demand, then interest rate will be decease of this economy. So market interest rate or cost of borrowing of fund depends on the money demand and supply. We can show how determination of interest rate by the following graph. Incase of changing the demand, where supply created. The normal equilibrium point is here 10%. 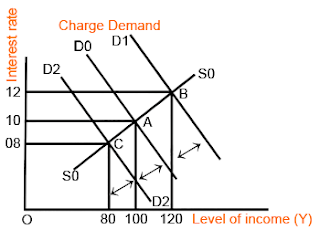 The current interest .96 demand of currency is increase, the new demand curve be D1 and new equilibrium point . which will increase the interest towards 12%. Again if demand become decrease and demand curve be down shifted, the new interest rate will be at 8%. 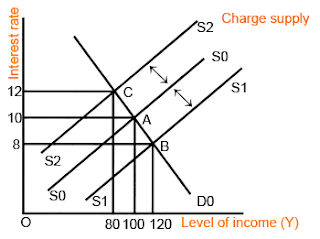 Incase of changing the supply of money, interest rate also change .96 supply of money increase in the market, then supply curve will be shifted down that will decrease the interest rate at 8% .96 supply of income decrease then supply curve will shifted upward that will increase the interest rate at 12% in the equilibrium point of C.